Pinellas County Sheriff Bob Gaultieri chairman of the MSD Commission investigating the horrific shooting at that school last year launched into the LE response. This is the one we’ve been waiting for. On the second day of the hearings the LE response was laid bare. The net result, a terrific failure by the Broward County Sheriff’s Office to address this critical incident. As the data was presented the audience held their hands over their faces, chewed their nails or sat perfectly still. Special attention was paid to the School Resource Deputy, scot peterson and capt. jan jordan, the incident commander. Any cop, from a prob to a seasoned veteran knows that active shooters require immediate action to meet and “neutralize” the threat. This did not happen. In the military the commander is responsible for everything that happens or fails to happen. 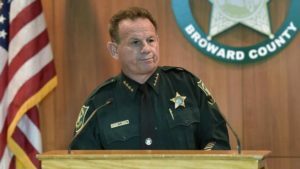 In this instance the blame must lay at the feet of the Broward County Sheriff, scott israel. We’ll take another look at this later.